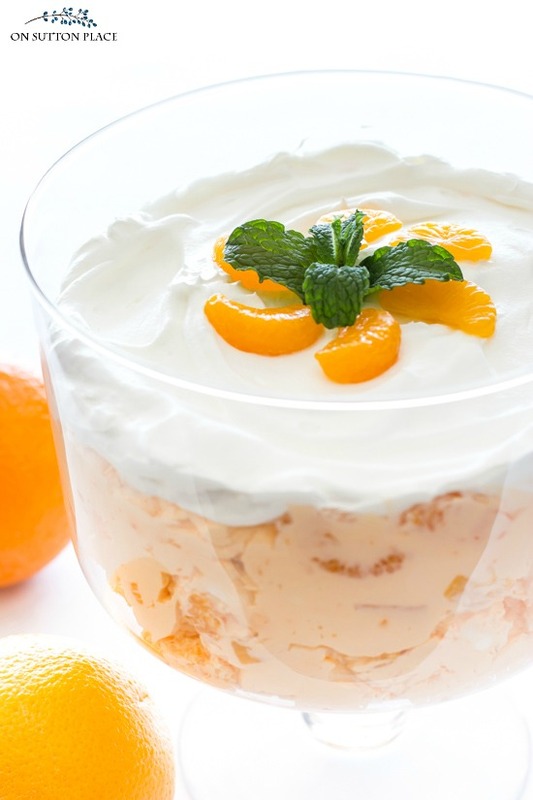 Delicious and refreshing Orange Fluff Salad Recipe that’s quick & easy. 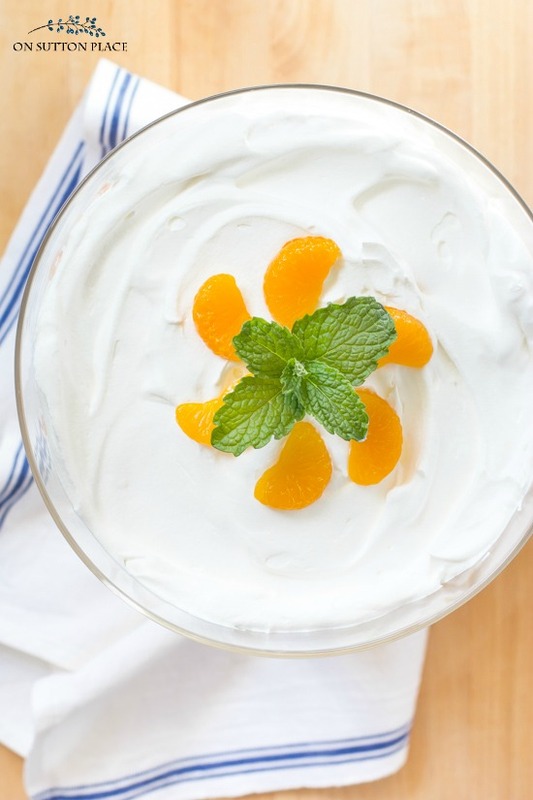 An orange jello salad that can double as a dessert! This orange fluff salad recipe is one of those go-to dishes that is so refreshing and actually does double-duty because it can be served as a salad or a dessert. In fact…it is so good you will find yourself sneaking a helping or two when no one is looking! It goes together very quickly and lasts in the refrigerator for several days. It does not separate or lose its texture. Another great thing about this salad is that it makes a generous amount. When I was finished folding it altogether, my Kitchenaid mixing bowl was almost full. It definitely makes enough to feed a crowd. Delicious and refreshing Orange Fluff Salad Recipe that's quick & easy. 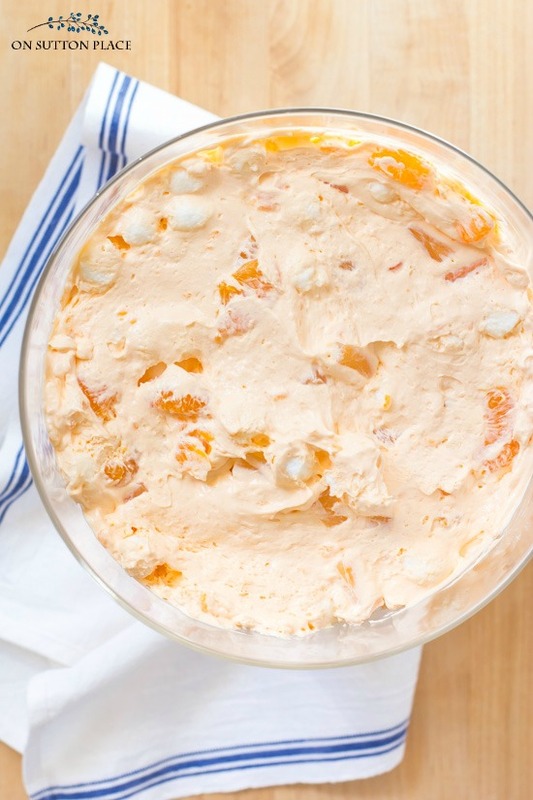 An orange jello salad that can double as a dessert! Mix together pudding, jello and water in a sauce pan over medium heat. Bring to a boil stirring often. Remove from heat and pour into the bowl of a standing mixer. Beat on high 5 – 6 minutes until creamy. Fold in Cool Whip, marshmallows and fruit. Transfer to glass bowl or trifle dish. Chill before serving. Any size cans of fruit can be used, depending on how "fruity" you want your salad. 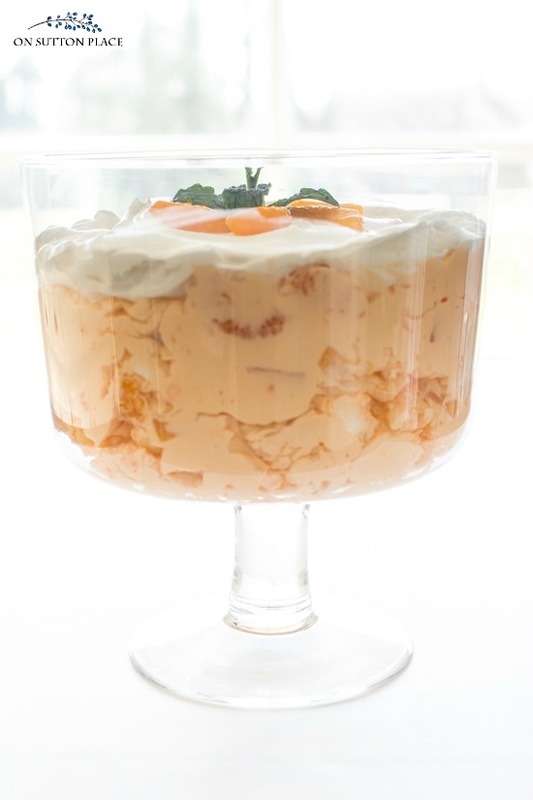 If serving in a trifle bowl, reserve a few mandarin orange pieces for garnish. Switch to strawberry jello | substitute fresh or frozen strawberries for the mandarin oranges. Switch to peach jello | substitute diced canned peaches for the mandarin oranges. Can be served individually in ramekins, clear bowls or mason jars. Put the whole salad in a clear trifle bowl and let guests help themselves. Before serving, top the salad with a layer of Cool Whip and garnish with mandarin oranges and fresh mint. This orange fluff salad recipe is perfect to take to a potluck dinner or picnic. With spring definitely here and summer coming soon, this orange jello salad is definitely a recipe you should keep in mind. If you’re wondering, I didn’t eat this whole thing myself! I shared some with my dad and he loved it. He told me it reminded him of a dessert my grandmother made called Pineapple Puffs. I googled it and found what I think was her recipe…so it may be appearing on the blog soon. Join the OSP email subscriber list! I call this Delicious!! I know it’s a salad but I could eat this as a meal! Oh my goodness I just made this Friday for neighbors. ;). I added chopped pecans and shredded coconut. This is just a good classic recipe. Thanks for sharing. hi there, meant to make memorial day, then father’s day, then 4th of July!! Just, made it!! HA !! I did exactly what you printed out. It seemed to take quite a while to come to a boil on the cooktop. I did not wait for a rolling boil, just was bubbling up. then to kitchaide and fridge. then whipped it. then folded in almost all of tub of cool whip saving for garnish. I drained fruit but not dry. Then used spoon to get out fruit so some liquid was still going into mixing bowl. It seemed runny. not firm. I mean the coolwhip firmed it some. I still feel it would run on your plate??? Will it firm up more now in fridge??? Hi Debbie…wondering how your Orange Fluff turned out? I have made this too many times to count and never had an issue with it setting up. It’s firm enough to actually cut. Sharing my no cooking required version I have been making for several years now, just call it Peach Fluff. Add drained fruit in a large mixing bowl, sprinkle in jello and stir well. What moisture is left from the fruit is all it takes to dissolve jello, so drain fruit really well! If using crushed pineapple, press through a strainer to remove all excess liquid. Next, add container of cottage cheese and mix well. Add cool whip and mix again. This is the basic recipe. Add additional ingredients as you like. I HAVE to have coconut and the mini marshmallows in mine! Devine! Keep refridgerated. This recipe was given to me from my husbands aunt. It has since become a staple for Thanksgiving and Christmas dinners and it’s a cool, sweet summer treat! I’ve made this Orange Fluff recipe for over 25 years. It is easy and so refreshing. Ann, thanks for sharing all your ideas. Especially the printables. They are all adorable. What size (ounces) cans of pineapple and mandarin oranges do you use? Could you drain each can and add enough water to make the 2 cups that is called for? I used a 15 oz. can of mandarin oranges and a 20 oz. can of pineapple tidbits. Using the drained liquid from the cans of fruit is a great idea. Let me know how it turns out! Ann, You shared a recipe several years ago with strawberries, cool whip, and graham crackers. Just wanted you to know it is a family favorite. I HAVE to make it at least once a month during strawberry season. This recipe sound great too. I am certain I will be making it soon. Thanks for all you do and this wonderful website. I would like to know if you cook the vanilla pudding before you add the jello & water ? No…you cook the pudding, jello, and water all together. Enjoy! Why can’t instant pudding be used? Hi Nancy…I honestly don’t know. I am not sure what would happen to instant jello if it was cooked? Sorry I can’t be more help! My similar recipe is called Ambrosia but it doesn’t contain the pudding. Will have to try your version. I always make mine in a Tupperware jelly mould served on top of a footed cake plate. I like your presentation idea of a trifle dish. Thanks Ann. I make something similar except I mix 1 box of orange jello with drained cottage cheese, mix in can of drained crushed pineapple and can of drained mandarin oranges and a carton of cool whip. Refrigerate and serve. I’ve also reserved enough cool whip to go on top. You really can’t mess it up! My mother in law requests it for every family gathering along with broccoli rice casserole. Have you ever made cherry pie filling fluff? All you do is mix one can of pie filling with one can of sweetened condensed milk, a can of drained crushed pineapple and a carton of cool whip. Refrigerate til firm and call it delish, too! My Aunt Ruthie always made this salad for family occasions. Haven’t had it in a while since she passed last year. Thank you for the sweet memory. I’ll have to make it for my nieces and carry on the tradition! So my family has made this recipe for as long as I can remember. Everyone loves it! I started taking it to my husbands family get togethers and it’s a hit every time! We do however, use tapioca pudding in place of vanilla pudding. Making it now with vanilla… we’ll see if my family notices a difference tomorrow at Thanksgiving dinner! Ohhh I bet tapioca pudding is amazing! This reminds me of the jello salads that were so popular back in the 1970s. My mother’s favorite was an orange congealed salad with pineapple, pecans, and cream cheese. She still makes it, and I have made it a few times too, usually around the holidays. Those jello things can be surprisingly good! OH, Yummy! We used to make it when I was little, but with cherry pie filling and pineapple. It was my absolute favorite… I bet it’s lovely with the oranges! Sounds delicious! I’ve pinned this and I hope to make this soon. Maybe one of the desserts for our Easter dinner? Thanks! The dessert loks tastey, will have to give it a try. It was your Liberty Blue bowl that caught my eye, isn’t is amazing how those dishes make everything look so appealing! Oh, Ann! Orange fluff is one of my favorites! My mom makes it for every holiday, and I try to hoard it for myself. I may have to surprise her and try to make it myself! This is just the kind of recipe I love and I can’t wait to try it. Hi Ann, I have to tell you this how much I love this dish! This is a very popular recipe where I live. You never go to a church covered-dish or family get together without seeing it. Love it, thanks for sharing. Ann, I have completely forgot about that dessert. My mother used to make it for our family reunion picnics every summer and we all loved it. It was a real treat but reserved for picnics. Not sure why but it seemed to make it even more special for all us kids. I think I will have to make this for my own children to give them a little taste of this treat from my own childhood. Thanks Ann. Great post. Our family loves Orange Fluff too! We have it and Watergate Salad every year for Thanksgiving and Christmas…such sweet additions to a meal! Ann that looks so good!! Your photos are beautiful! looks yummy-licious, good for a cool summer dessert! My mom makes this dish for every family function and I have never tried it. Your photos look amazing are you using your new lens? Thanks so much for the yummy recipe! Reminds me of a dish that was served in the “Garden Room” of a department store during the 70’s. My mom would take me there for lunch when she visited me in college. Can’t wait to try it! 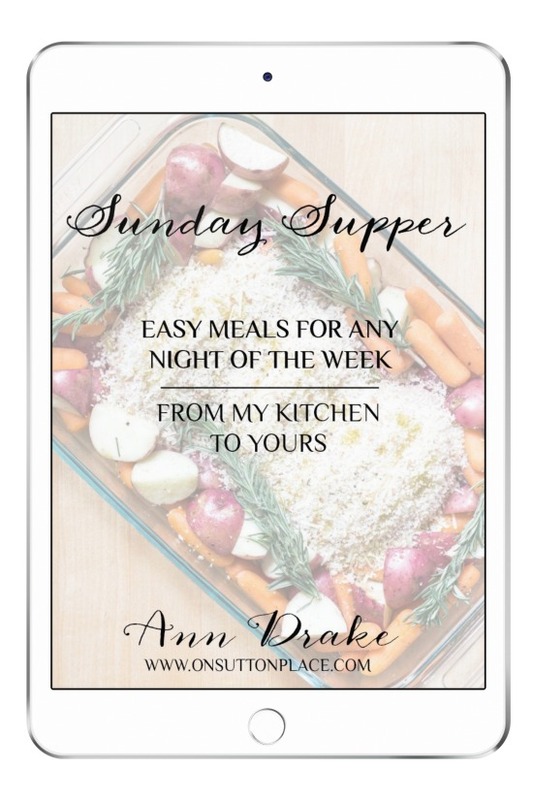 Thanks Ann for a colorful side dish for my Easter dinner menu. For the past three weeks, my husband and I have been treating ourselves to oranges for an afternoon snack. He says that it has kept us from the endless colds our young grandchildren have been sporting. This reminds me of many of the desserts we would enjoy at church potlucks growing up and now I absolutely HAVE to make this Ann! :-) It would be delicious and bring back memories which is the best kind of food in my book. Thanks for sharing it with us and your photos are GORGEOUS! This is a Thanksgiving tradition in my husband’s family, but we use a slightly different variation, skipping the pudding and marshmallows. It’s a great recipe for kids who want to help in the kitchen because there’s really not much cooking or measuring involved. You’re right about amount it makes! This is what every older female relative made for all of our reunions and carry-in dinners after church and when the church cooked for funerals at the church. It must be a rural dish or midwest/southern thing! I knew I could count on it at every reunion from Texas to Missouri. I grew up in south central Kansas and my Grandma made it frequently! Glad you enjoyed it. My girls will be so proud of me when I tell them I have found an orange fluff! Thanks Ann. This looks very delish! I have a recipe that is similar and my father in law always requests it when we get together. Thanks for sharing, I am always looking for new recipes to try.